When Lubavitch Rabbi Mendel Bendet and his wife, Shterni, decided to become shlichim — Jewish emissaries — a number of people suggested that they consider opening a Chabad house in none other than the Poconos. That was just over a year ago. 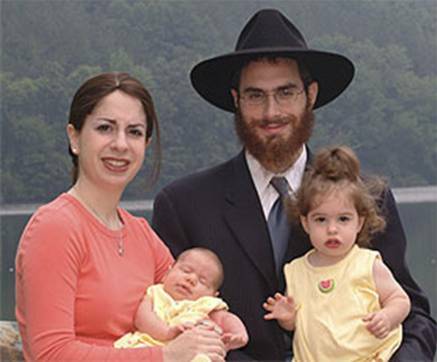 The Bendets — and their baby daughter, Chaya Mushka — have since moved from their home in Brooklyn, N.Y., to Stroudsburg, Pa., to create Chabad Lubavitch of the Poconos, under the auspices of the Lubavitcher Center in Philadelphia. Bendet said he’s been told the unaffiliated rate in the Poconos is as high as 80 percent. Last fall, shortly after the couple arrived, they held High Holiday services at a local hotel for those who otherwise had no place to go. Since then, the Bendets have hosted a Chanukah party, Purim festivities, a kids’ crafts club and a weekly class for adults on the Torah portion. The couple has also added another member to their ranks: another daughter, Faygie. This year, the rabbi and his wife will be expanding their efforts and running a Hebrew school. Noting the sheer geographical expanse of the area — for now, Bendet is the only Chabad rabbi serving the Poconos — he has arranged for some student rabbis to help out by visiting people’s homes and offices, doing everything from teaching a class to hanging a mezuzah.